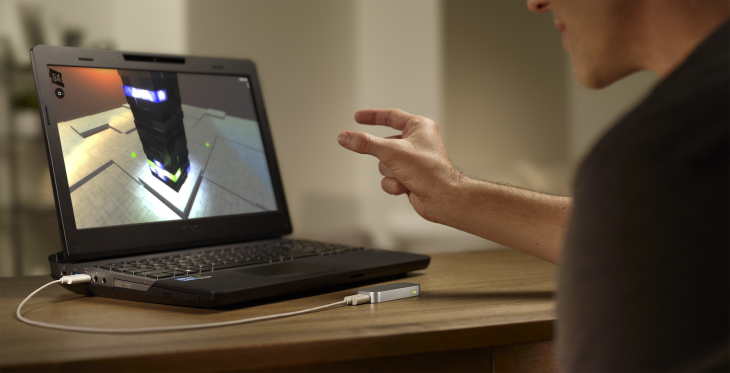 Leap Motion, the smart 3D gesture control hardware and software company, has said that the first tablets or smartphones to use its touchless technology could arrive as early as Q3 next year. Company CEO Michael Buckwald told TNW at a briefing in London today that the technical and hardware challenges of putting its system into devices with a smaller form factor (like phones) had been solved, and while there was no roadmap set in stone yet, the first tablets or smartphones to integrate it could arrive in Q3 or Q4 of next year. We’re there today in terms of the mechanical and physical part of the equation. We expect that there will be tablets and phones in the market with Leap Motion technology embedded next year, probably in Q3 or Q4. It’s not ready for the prime time in tablets and phones quite yet, but when it is Buckwald said that the use case for each could be quite different. For example, while the platform already has a number of popular mobile games (like Fruit Ninja and Cut the Rope) which would likely prove popular on smartphones using the tech, Buckwald said that the company was in discussions with OEMs to see what other more in-depth features it could potentially offer on larger tablet screens. [For tablets] it’s about creating a three dimensional experience for interacting with the tablet. There are some unique things though that we’re talking to OEMs about because you could use that 3D space to interact with screens that are distant as well. So you can imagine syncing an Android phone to a TV on the other side of the room and then using the space above it to control that TV. We started with PCs but we want to be in tablets, phones and in the future TVs, head mounted displays and even things like cars. While the company is always looking ahead to integration with more devices – a new deal to integrate it into HP all-in-one (AIO) and desktop keyboards was announced just a few days ago – but that doesn’t mean it isn’t working on its core proposition: the gesture tracking software. 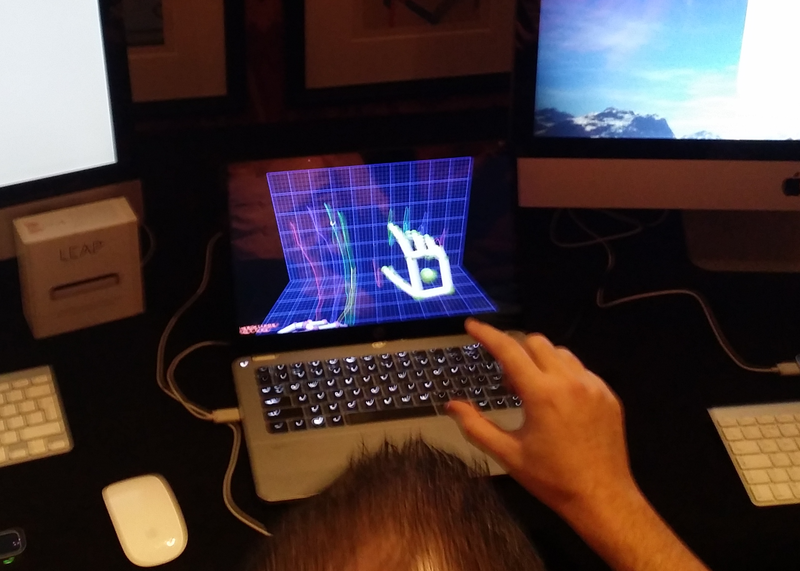 Indeed, Leap Motion also revealed today that a new version of the software will roll out to users who have already snapped up a Leap Motion controller with an update that’s currently in private beta testing, but due to be offered to all in January next year. It’s a big one too, bringing with it far more detailed tracking of a user’s hands, shown nicely (if a little blurrily) in the image below. The current version of the software would show just dots on screen to represent each of the ten fingers moving. With the new software, the whole hand is tracked and represented on-screen by a wire frame. With the update will come a greater level of control, allowing for more detailed and precise movements. Another key advantage this brings is for both of the user’s hands to be shown on-screen, which will be particularly useful when using things like the Free Form 3D sculpting app. Once a model has been created using the program, it can then be sent to a 3D printer for manufacturing. The accuracy afforded by being able to see your hands represented within the app while modelling will be unprecedented, and the ability to go from modelling to production by using a 3D printer directly removes a further barrier between the real and digital worlds. 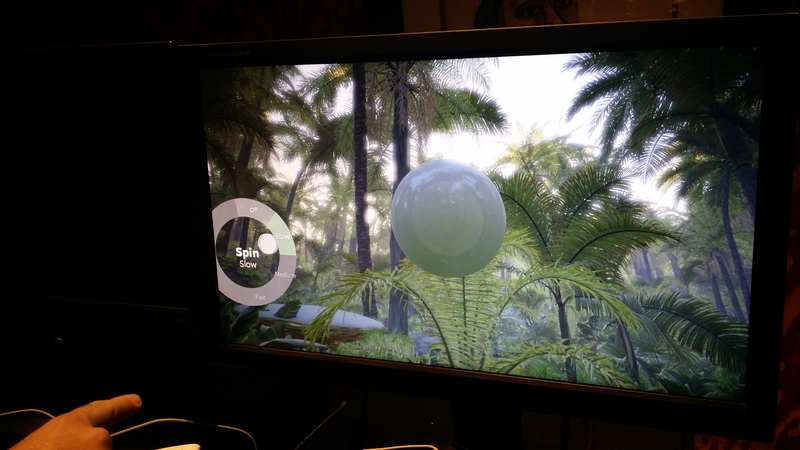 In addition to revealing the new tracking software, Leap Motion also announced today that it was making the Free Form app open source, so that devs could use some of the company’s approach to apps – such as the point-and-hover menu system (shown above) – in their own apps. To date, there are around 85,000 developers making apps for the platform, and around 150 available to download as of now. With these updates, we can only imagine this number continuing to grow rapidly.